Being a DJ, producer, label manager and computer music editor, Uto Karem has a broad vision of what electronic music is all about. Having spent his junior years in London, Uto's music ear was first shaken by bands such as New Order, Depeche Mode and Soft Cell. On his return to Italy as a teenager, it was Underground Resistance, Novamute and Plus 8 that were having most impact on the young man. In his late teens his DJ career took off, and over the years he has supported many of the world’s greatest deck talents. As a natural progression he took two years to study Audio Engineering that lead him to develop his own musical style, at the same time he was working as an editor for a computer music magazine, where he was reviewing and testing all the modern technology available for DJ's and producers. Uto Karem in just a short period of time has produced hit after hit with forward thinking dance tracks that have fast become staples for DJs everywhere. As well as being an in-demand DJ, producer and remixer, he also runs his own Agile Recordings imprint on which he explores deep techno rhythms and highly addictive baselines, from himself and brilliant forward thinking artists. 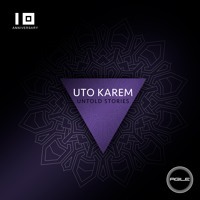 With his unique trademark Uto Karem has been busy producing groove induced, high-energy tracks for legendary labels, with the ability to infuse cutting edge machine music and soulful grooves. With selected sets from worldwide touring. "Utopolys Radio" is broadcasted live on more than 50 radio station’s in 30 countries. Utopolys Radio 088 - UT ..
Uto Karem is back on his own label with a new EP featuring three original tracks in his trademark style of charismatic techno. Early Support: Karotte (Official Fanpage), Secret Cinema, Joseph Capriati, Misstress Barbara, Spektre, Bart Skils, LOCO & JAM, Lee Van Dowski. Uto Karem - Broken Sita .. Rave Zero9 and the building tension of its pads combined dramatic bursts that only add to the intensity. With waves of tidal force the tracks nonstop structure twists and turns to ensure none is leaving the dance floor during this captivating roller coaster ride. Early Support by: Karotte, Secret Cinema, Joseph Capriati, Misstress Barbara, Spektre, Bart Skils, LOCO & JAM, Lee Van Dowski. Uto Karem - Rave Zero 9 ..